Sen. Rand Paul, R-Kentucky, warned that the U.S. could be underestimating the potential for Ebola to wreak havoc in the U.S. because of "political correctness." "It's a big mistake to underestimate the potential for problems worldwide," Paul said on "The Laura Ingraham Show" Tuesday. Citing reassurances by the head of the Centers for Disease Control and Prevention (CDC), Tom Frieden, that there was little risk of a traveler bringing Ebola to the United States and causing an outbreak, Paul countered, "I really think that it is being dominated by political correctness and I think because of political correctness we're not really making sound, rational, scientific decisions on this." The CDC announced Tuesday that the first U.S. case of Ebola had been confirmed in a Liberian man who had traveled to Dallas to visit family. "We should not underestimate the transmissibility of this," Paul, an opthamologist by trade, said, noting that even doctors and nurses wearing gloves, gowns and masks are contracting the disease. "My suspicion is that it's a lot more transmissible than that if people who are taking every precaution are getting it. There are people getting it who simply helped people get in or out of a taxicab." The World Health Organization says that health-care workers have frequently become infected while treating patients with the virus because of "close contact with patients when infection control precautions are not strictly practiced." Paul, who is thinking about running for president, also questioned President Obama's decision to dispatch 3,000 military personnel to West Africa to help combat the spread of the disease. "Where is disease most transmissible? When you are confined on a ship," Paul said. Could the U.S. have done more to prevent Ebola from arriving? He also assailed doctors like Ezekiel Emanuel - the brother of former White House Chief of Staff and current Chicago Mayor Rahm Emanuel - who said on MSNBC Tuesday that people who suggest there will be an outbreak in the U.S. are "fear mongering." Paul pointed to past outbreaks, including the Spanish flu in 1918 and the Bubonic plague in the 14th century that killed millions to demonstrate that disease pandemics can spread rapidly. Ebola survivor: Response to outbreak "sluggish and unacceptably out of step"
Earlier in the show, he sarcastically said to Ingraham, "I can't believe that you don't think it's enough of a plan to prevent worldwide pandemic to cough into your elbow. If you just bring your elbow up to your mouth and cough into it, surely that will stop a worldwide pandemic," a reference to the president's instructions to the American public in 2009 to sneeze into their sleeves, rather than their hands, to help stop the spread of the H1N1 flu virus. 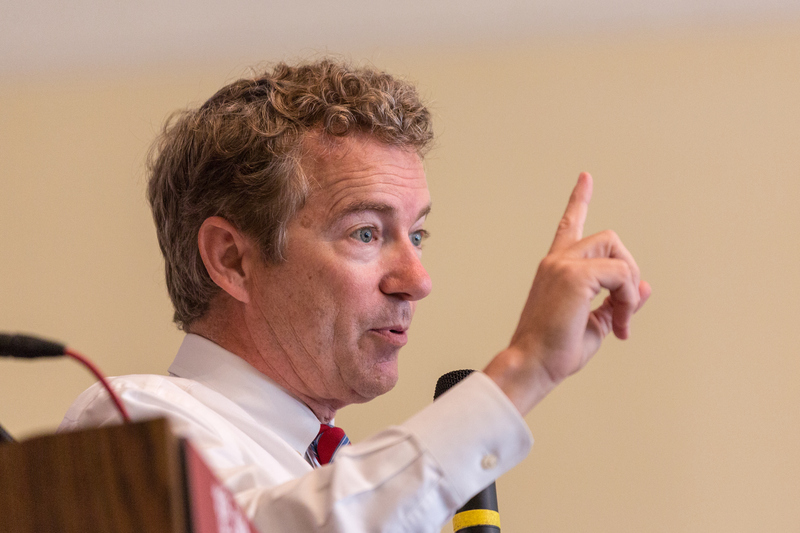 Not all politicians share Paul's view that the U.S. is taking insufficient precautions. On the other end of the spectrum Wednesday was Texas Gov. Rick Perry, who held a news conference to calm residents of his state, ground zero for the first U.S. Ebola case. "There are few places in the world better equipped to meet the challenge that is posed in this case," said Perry, who is also considering a presidential bid. "Texas is one of only 13 states certified by the CDC to conduct diagnostic Ebola testing. And we have the health care professionals and the institutions that are second to none. The public should have every confidence that the highly trained professionals involved here will succeed in this very important mission," Perry said. "This case is serious. Rest assured that our system is working as it should," he continued. "Professionals on every level of the chain of command know what to do to minimize this potential risk to the people of Texas and of this country, for that matter."